Autumn is here and with it, comes cooler nights and less light. Have you noticed that your lovely landscape is dark when you go to work? Soon it will also be dark when you return home at night. What if there was a way to present your home and landscape as the highlight of your neighborhood? There is a way, and we call it “accenting with light”. The purpose of lighting your landscape is to enhance your home while adding security. A well lit home is a deterrent to prowlers. So, let us begin by looking at the method of accenting with light and the products we use to get the job done. Neighboring properties impact the view of your home and how it presents itself to the viewer. During daylight, you can’t control the background, but at night, the background disappears when light is added to the foreground. The careful addition of lights will help bring attention to the important aspects, therefore forcing people to see what you want them to see. You can see in the photo examples that the plants and the building are the focus of attention and all else recedes. The same is true in a backyard with woods. If you carefully add light to the edge, you create a sense of depth, which makes the space look larger. More fun than working with hiding backgrounds, is highlighting important elements. Important elements such as: focal points, specimen plants, patios, walls, and/or water features. The combination of accented elements helps to create a dynamic view while greatly enhancing the use of your landscape for your family and friends. Adding landscape lighting to your property makes a difference so great, it is like comparing Standard TV to HDTV. Hillermann Nursery & Florist can add this level of enjoyment and beauty to your landscape by using Kichler LED lighting products, the premium choice in landscape lighting products. 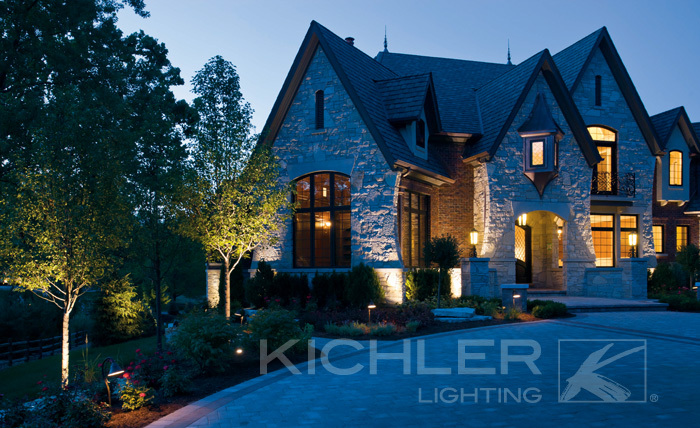 Kichler’s fixtures are made of a variety of materials and finishes that will be sure to match the style of your home and landscape. Kichler LED light fixtures are guaranteed for 15 years, or 40,000 hours of use. Many of the other elements are guaranteed for life. 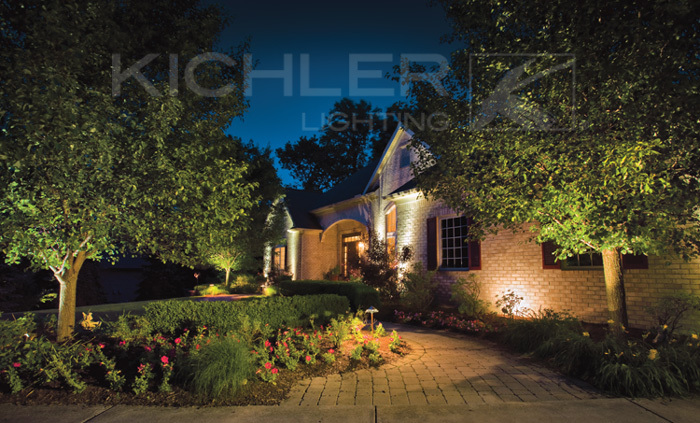 We could go on and on about the advantages of having a Kichler Lighting system installed, but the best way for you to see how it can enhance you home is for you to see for yourself. Our lighting designer will bring out our demonstration kit and show you. Seeing is not only believing, it is exciting! Call us at 636-239-6729 for a demonstration at your home.